CHANNEL Jurnal Komunikasi publishes study and research articles in communications and media, including: interpersonal communication, mass communication, advertising, communication strategies and media studies. Papers can be submitted in any of the following forms: articles (should be approximately 6000 words long; however, both shorter and longer manuscripts will be considered), and book review (the average review should be about 1500 words long). 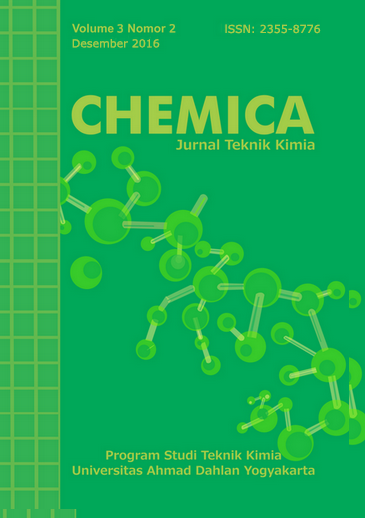 CHEMICA Jurnal Teknik Kimia ISSN, 2355-875X (print) 2355-8776 (online) is a journal that publishes manuscripts or scientific papers in Chemical Engineering. The scope of this journal covers chemical reaction techniques, separation, optimization, process control, process system engineering, waste treatment, food and material technology. Journals are published in print and online twice a year, in June and December by Chemical Engineering Program, Faculty of Industrial Technology, Universitas Ahmad Dahlan Yogyakarta.